In my article about a Fresh Look At The Industry Standard For Horse Care I posed the question: What could we do better for our horses so they can have a happier life? I wrote about horses’ basic needs for movement, socialization, forage, and bare feet, and how it is a challenge to provide these in the modern training and boarding business model. We need to break free of the ‘pack in as many students and horses as possible’ business strategy. This only leads to bad lifestyles for horses, and to burned out professionals, where often the ‘most successful’ ones end up being the most stressed out. We’ve all seen the cartoon of the cranky horse trainer, but what can we really do to avoid becoming that? The beginning of a new way. After finding myself burned out (I almost quit horses! ), single, and with a new property, I had a chance to create a brand new life for myself and my horses. I had trained for 20 years out of a big dressage training barn with lots of stalls, few turn-outs, 8 trainers and 50 boarders. I now craved peace, quiet, and space. My training process had also changed. As a result of my exploration of natural horsemanship I had to create an entirely new training system. This new system focused not only on how I train, but also on helping students take responsibility for their learning, and empowering them with the tools for independent problem-solving. This was born from the need to offer continued support to the students I was traveling the world teaching in live clinics. I had to figure out a way to give this hugely valuable and unique information to students in a form they could use even if I was only able to come to their area once a year. It was also born from an inherent belief that great teachers don’t just offer information, but help students realize their inherent abilities to learn. 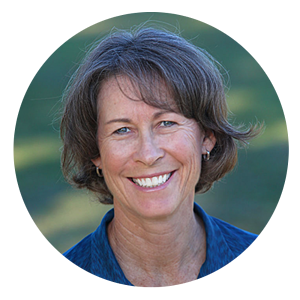 Through my desire to serve at this level, I discovered and documented my unique system, developed transformational learning experiences around it, and created exercises that promoted independent problem-solving. 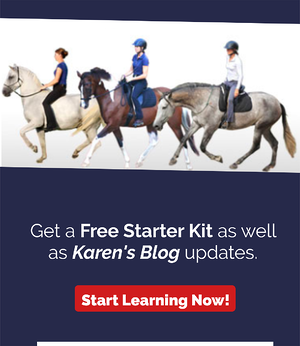 Then I was able to leverage it through writing a book, and by being one of the first people to create step by step, highly supported online courses for equestrians. But here’s the important part: This had a direct positive effect on the lives of my horses. If I had simply continued in the normal model of teaching more private lessons, or having more horses in training, or having more boarders I would have had to cross-fence, limit turn out, have more horses in stalls, and more people on my property. I would have been tied to my property with less and less time for my own horses or my own life… All this would still be no guarantee I would be profitable, and eventually I would be just another tired, cranky horse trainer. In mentoring professionals, I know that this is a common story. Many professionals need a second income source (a spouse’s business, a sponsor, or a facility owner) just to be able to survive having their horse training business. Many instructors put their own horses last. Many trainers have no life outside of their business. Many feel guilty admitting that they would like some free time. Horse trainers are a hard-working bunch and many of the ones with the most business are the ones that feel the worst. No matter what you teach, figure out what your system is. Think about what your students really need and get creative about how you can offer that. Break free of thinking that you are only exchanging time for money and realize it is value that you should be giving. Once you do that you will realize how many different ways you can give that value. The professionals I mentor learn to start by dreaming of the life they want with their horses, and then learn to truly embrace the unique value that they give. I then show them how to get creative in what they offer students, and help them set healthy boundaries for themselves and their time. You don’t have to run your business like everyone else. You can redefine what it looks like to be ‘professional’. Give amazing value to your clients. Set up your life the way you want it. Set up your horses’ lives so they can be happy. 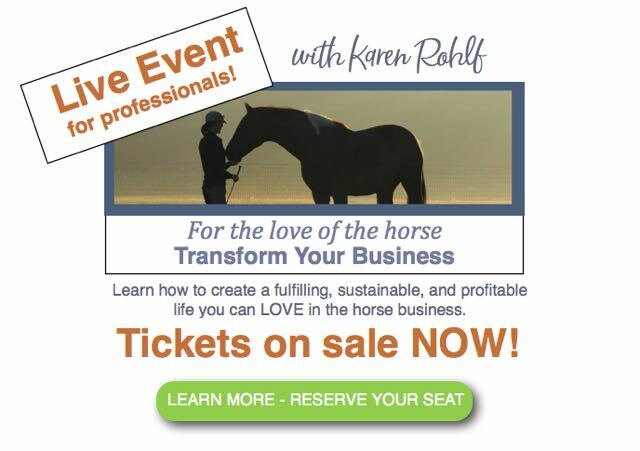 I have a LIVE EVENT February 1 & 2, 2019 in Orlando, Florida where I teach on the subject of creating a fulfilling, sustainable, and profitable life you can LOVE in the horse business. Subscribe to my Wednesday Wisdom emails to make sure you are alerted when tickets go on sale! A Fresh Look at the Industry Standard For Professional Horse Care.